Following a distressing and inappropriate tradition, a cisgender actor, Diego Luna, is playing the role of a transgender woman in Berlin, I Love You; a film due to premiere on February 8,2019. It is neither responsible nor excusable for a cisgender actor to portray this role. The New York Transgender Advocacy Group and Equality New York condemn this casting as yet, another example of transgender lives being portrayed poorly, and as an object of ridicule. It has never been ethically or politically justifiable for cisgender people to play transgender roles; not only because cisgender actors have been unable to portray the complexity of a transgender life, and because it is taking the opportunity away from those of transgender experience. The entertainment industry must stop casting cisgender actors to play trans roles until TGNC actors have equivalent opportunities as their cis counterparts. We will continue to remove each barrier to equality. We will continue to speak out against inappropriate casting choices. Therefore, we call for a boycott of “Berlin, I Love You” and all such productions that use transface casting rather than hiring actors who are transgender. It is also our hope that cisgender actors will begin to see the damage caused by accepting transgender character roles. It is the responsibility of all cisgender actors who are allies of the TGNC community to speak out against the inequalities of the industry, and to demand appropriate representation for minority groups. 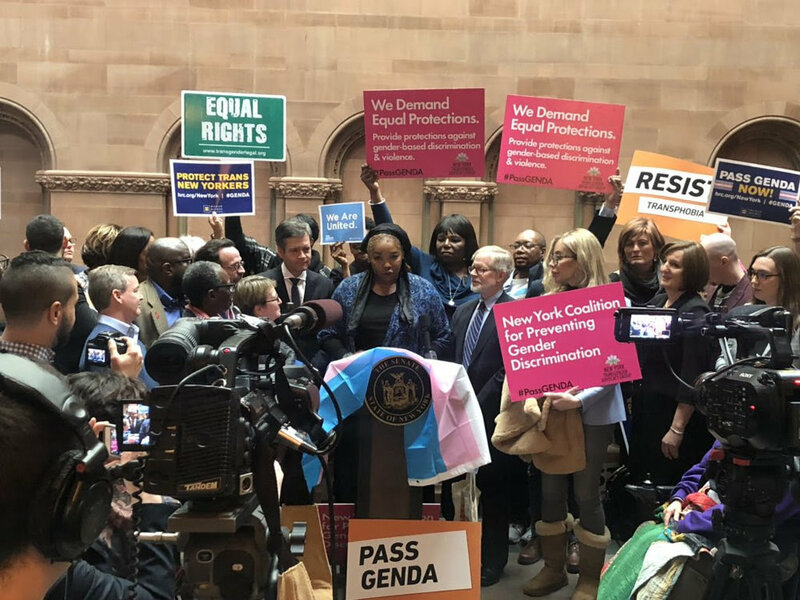 On Tuesday, January 15, 2019 after over 17 years of fighting to include gender identity in codified legislation in New York State, the Gender Expression Non-Discrimination Act (GENDA) passes in both the Assembly and State Senate. Historically, many LGB-led organizations and advocates have told the Transgender and Gender Non-Conforming (TGNC) community to wait their turn as they passed similar legislation to protect sexual orientation. However, many TGNC advocates have been at the front lines since the bill was first introduced, refusing to wait for their right and protection to be added to New York State Law. After so many years of hard work and advocacy, Assembly Member Richard N. Gottfried and State Senator Brad Hoylman brought in the needed votes to clinch this victory. Governor Cuomo who has had GENDA in place via executive order since 2015 also announced the legislation was on his first 100 days 2019 Justice Agenda. The current leadership in New York State is both refreshing and foreshadowing that the new democratic majority will get passed. "Tuesday was a tremendous victory for TGNC New Yorkers from Buffalo to Staten Island. The community as a whole had to wait for 17 years for this moment. Yet unlike 2012 I didn't see the celebration from LGBTQ+ folks it shows we have so much work to do and we still need to educate those why this moment was so needed and wanted and meant to be celebrated"
"Today knowing that there's protection in place for Trans people puts me at rest. Now the job to enforce GENDA, making sure all people adhere to it & be held accountable is the next step."